We are all suffering from jet lag...which means difficulty sleeping when we are supposed to sleep...sleeping until almost noon when we do fall asleep...and even after getting up we move about like sloths! Yikes! By the time we got ourselves out of the house it was almost 4PM! Thankfully we had done some grocery shopping yesterday, and so had enough essentials to survive. It was a cloudy and rainy afternoon, but the rain was very light and our rain coats were more than sufficient. After stepping outside, a lady wearing a rice paddy hat and carrying two baskets of fruit, each hanging on either side of a long rod that rest on her shoulder, tried to sell us whatever it was she was selling, but we shook our head and she carried on. We are a bit wary of street vendors here, and you'll see why a little later on in this post. 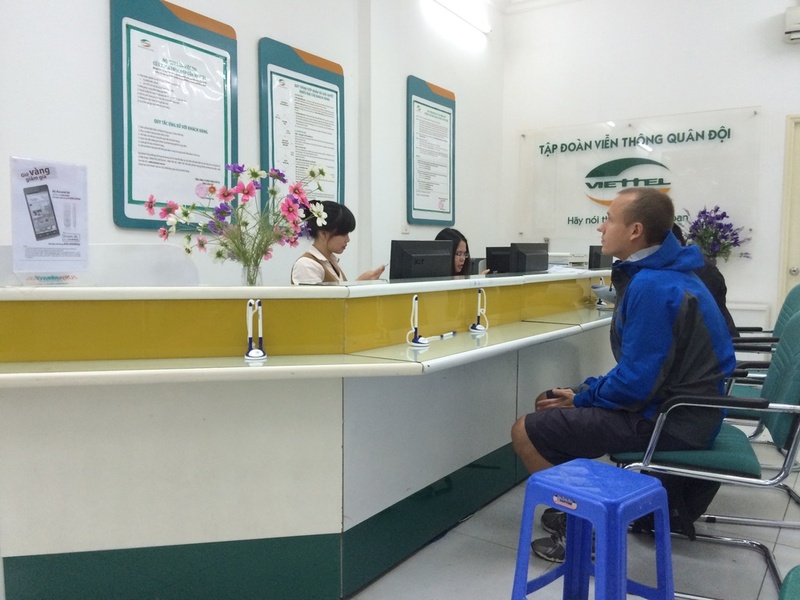 Our first task was to head across the street to a Viettel store and get a Vietnamese SIM card/phone number. They were fairly quick (especially compared to the process in Europe) and the card and plan cost us only $10. It gets dark fairly early here at this time of year, so by 5:30 PM it was completely dark out. We decided to just take a quick walk towards the Old Quarter (which is about half a mile from our apartment). On our way, we passed Hoan Kiem lake and saw the Welcoming Morning Sunshine Bridge all lit up in red. The entrance to the Ngoc Son Temple and the Turtle/Tortoise Tower were also lit up and beautiful..
Old Quarter & An Introduction on how to NOT Haggle! The Old Quarter is a very happening place, and as such, it is a very touristy area. Most hotels are in this section of Hanoi, along with booking offices for everything, from private tours in Hanoi to all sorts of trips around North Vietnam which start from Hanoi. 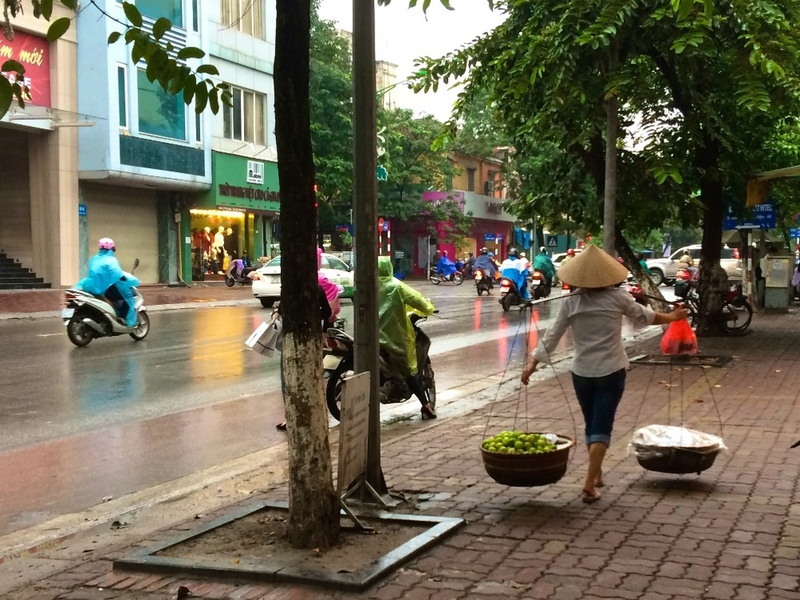 Shortly after we entered the Old Quarter, one of the street "vendors" must have smelled our freshness in Vietnam! She ran up to us, put her rice paddy hat on our heads, put her fruit basket rod on our shoulders and told us to take pictures. Then, as we figured she would, she all but made us buy bananas and a tiny pineapple. 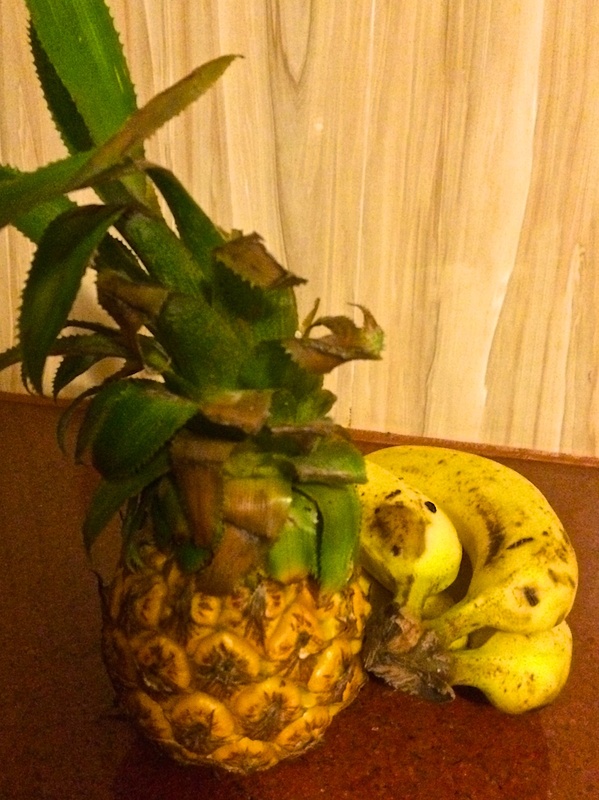 You see those 4 bananas and the tiny pineapple (in the picture below)? She quietly but quickly whispered, 250,000 Dongs ($12! ), as another fruit vendor was approaching. 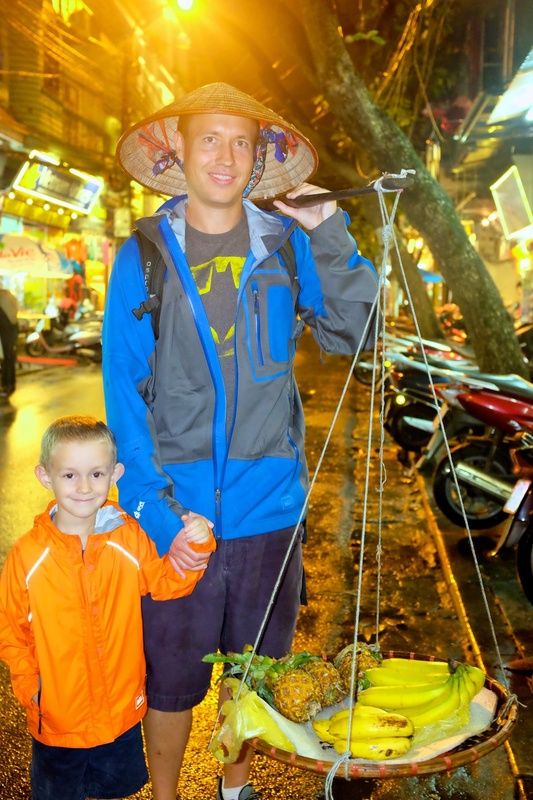 We had heard that in Vietnam you have to haggle with street vendors because that's just how it is and otherwise you are really overpaying, and this confirmed it for us. We said "no thanks, how about 50,000 ($2.50)? ", which we thought was more than fair for the fruits and the photo op. Then since we didn't have 50,000 we pulled out a 100,000 bill. If you are planning to haggle, make sure you have exact change! A street vendor who is overcharging you is NOT going to give you change back! DUH! She took our 100,000 ($5, which we've gotten entire meals for less here) and went on her merry way. We continued our walk in the streets. They are packed with people and motorcycles (of course!). There are lots and lots of shops of every kind, and the shop keepers generally sit outside on the streets to try to sell you things. There are also a lot of restaurants. We picked a random one that was full of people. Not only did it have a good mix of Vietnamese and foreigners eating there, but what attracted us towards the restaurant was the kind staff. 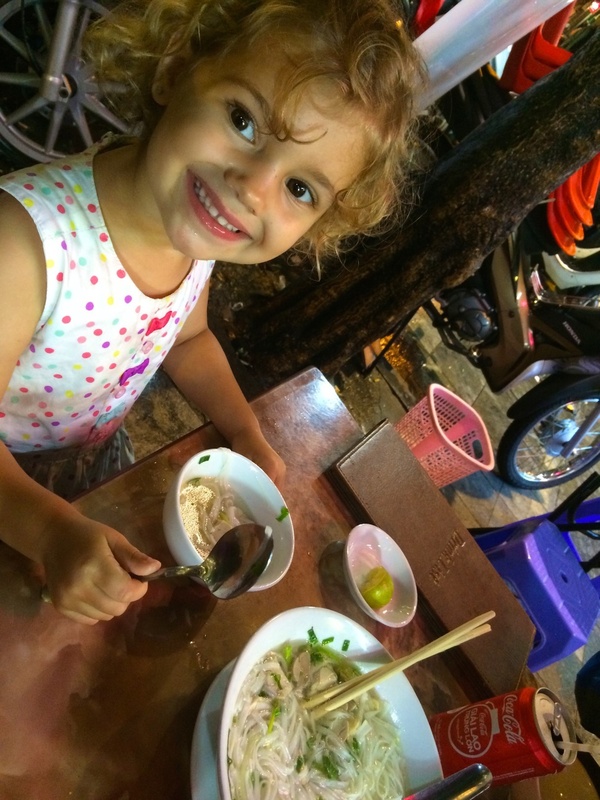 We had a very delicious meal with appetizer and dessert, and it all came out to $15 for 4 people :) The quality of the meal was very good, and both the kids and us loved our first Pho here in Vietnam! So delicious!! If you have ever heard that eating in South East Asia is really cheap, then we can officially confirm that it is true. Remember that we actually ate in a tourist geared restaurant in very touristy neighborhood, so you can actually eat for a lot less! Tomorrow, we need to get ourselves out of bed earlier to be able to enjoy more of our day and start to break the jet lag a bit.